Deciding what to do is not always as straight forward as it might seem. Of course, if there is a clear command from God directing us towards a specific activity then it is a little easier. However, how do we decide what to do when there are a number of options open to us, none of which seems inherently evil? There are lots of ways of thinking about this problem, but one way is to consider who we are doing the activity for, i.e. who gets blessed. For the follower of Jesus, there are three basic possibilities: for God, for me or for others. The diagram below shows what occurs when these motivations overlap. It is possible to argue that anything we do in obedience to God will bless us and others. This is, of course, true on one level. However, we are probably aware of times when we have faithfully served God and others, yet have not really been blessed ourselves. To make the diagram a bit clearer, let me give you an example. In July 2010 Scunthorpe Baptist Church launch the Scunthorpe Foodbank. Feeding those who are hungry is something that is clearly biblical (Matthew 25) and so it is definitely obedience. However, it also blesses other people; over 1,000 people received food in the first year alone. So then it is ministry, a good thing to do in itself. Finally, though, the exciting thing about Foodbank is the way in which it has blessed and transformed those who have been involved in running it. It therefore falls in the sweet spot in the middle of the diagram and is a key reason why I believe it has been so successful. 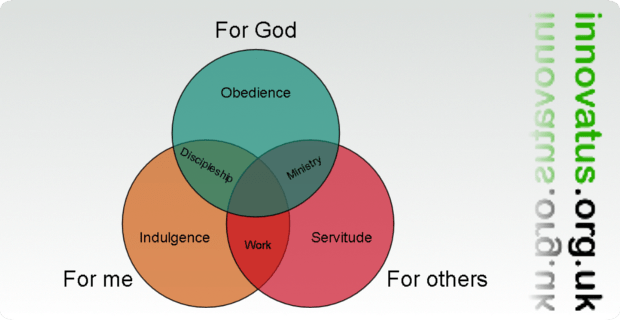 When deciding what to do, the best approach (in the absence of that direct command of God) is to find activities that fall in that spot in the middle of the diagram. This enables us to lead an integrated life where discipleship is never divorced from ministry and work is not a ‘secular’ task.